Emotionality, expressiveness and plot acuteness of sports moments require from a photographer the knowledge of compositional and technical peculiarities in order to avoid mistakes. The main distinction of sports pictures is their dynamic nature, which is mainly provided by instantaneousness of registration of an event, which lasts for fractions of a second. The blur, stipulated by motion of the object itself, depends on established exposure, on the speed of motion of the optic image on the surface of the photosensitive layer. That is why the blurred picture on the film is the greater, the longer the exposure is, the greater the speed of the object in relation to the camera is, the bigger of the focal distance of the lens, and the closer the object is moving to the camera. Consequently, in order to get a sharp image it is necessary to set the shortest exposure, to choose the short-focus lens, and to step aside from the object of shooting as far as possible. All these conditions are unrealizable altogether, as the conditions of illumination and masking restrict the exposure, and the short-focus lens at a big distance will not allow getting the image in rather large scale. That is why at shooting sports plots a photographer is to choose optimal combinations of the enumerated conditions, under which sharp image in rather large scale could be provided. Displacement (parallax) of image on the film depends on the angle of direction of motion to the optic axis of the camera. In case the object moves almost straight to the camera or from it, the exposure could be increased twice. It is necessary to remind again that cameras with a curtain shutter shall be placed so that the curtain of the shutter could move in the same direction as he object itself, otherwise the rate of movement of the object image in the focal level might coincide with the rate of movement of the slot, and the image will be blurred in the whole picture. 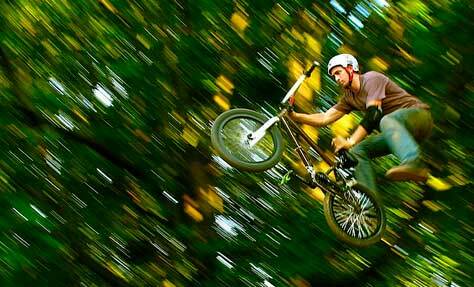 The effect of blurring of the image could be useful to express the swiftness of motion. A method, called “shooting with a lead” is used at shooting moving objects. The essence of the method is that after catching the object in the view finder, one shall evenly lead the camera following the object at such speed that the object practically does not displace in relation to the borders of the screen, and when the synchronism of motion is achieved, one has to press the shutter release. During the exposure the object is motionless in relation to the film, and the environment, and the background moves at great speed. In the picture, obtained like this, the moving object turns out to be sharp, and details of the background smear in stripes in direction of motion. The created effect in the picture corresponds to our visual perception of the moving object, when the eye follows the object, and the surrounding objects are being blurred. Of course, such method is applicable only at shooting of evenly moving objects, and it is necessary that all details of the object shall move in one direction at the same speed. For example, one can take a picture of a skier, evenly gliding from the mountain at a great speed, using the described method, but a figure of a skier, moving along the plain, won’t be obtained sharp as a whole, as his legs and arms at pushes displace backwards from the body, and will be depicted blurred. It is better to shoot motorcyclists, cyclists, ski jumping, water skiing, etc using the method “with a lead”.